Save Ladygrove Park! : It's Time To Object! Consultation Ended on the 28th February! This page will be updated with more news as we have it. Please sign the petition though - this is a public register of objectors outside of any control of the planners. Look at the plans - they want to turn the playing field into an office complex for commuters. We can save Ladygrove Park if we act together! 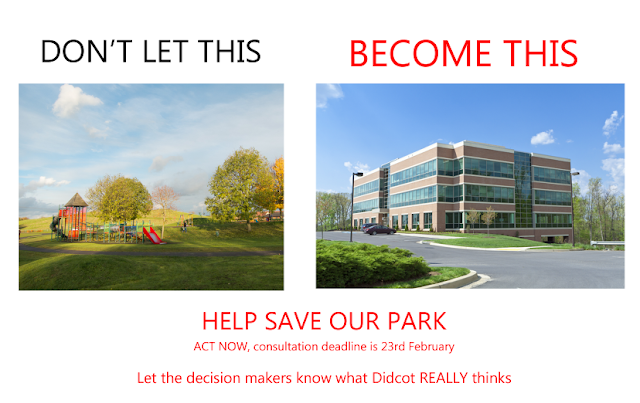 Didcot Town Council Vote Unanimously To Protect Ladygrove Park! On Monday 13th February at a extraordinary meeting to discuss the Garden Town proposals Didcot Town Council passed a motion including the following "Didcot Town Council...will by all available means within its power maintain the provisions of the lease in accordance with their original intention and decision and the area’s current use." This was a bold commitment and we applaud our council for taking this stand! Didcot Green Spaces Association have now asked the council on behalf of it's members and this campaign to support Ladygrove Park being declared an asset of community value and to be designated as a local green space within the planning system. Together these would provide a 6 month moratorium on any sale to allow the community to bid and would also see the park treated as green belt in any planning applications. We thank our town's councillors for their ongoing support in achieving these objectives.